05/30/10 - Site Update: Added NPC & Mission pages for Linewood/Needle Eye/Rest Stop/& Old Kingman as well as associated mission items and nearly 100 various items, added 85 Enemies covering the rest of the Lower Plateau and added 45 creatures into the biologic section of the Harvesting & Scavenging Guide, also reorganized the enemy section by taking non-harvestable mutants and combining them with humans in what is now the 'Humanoid' section and took the harvestable mutants and renamed their section 'Mutated Beasts', completed the easier navigation links project, finished inner-site linking for the Missions pages (minus a couple items to be added at a later time), updated mutations and special abilities in the Stats section to conform to the revamp from Patch 1.4, and finally added 2 more stories to the Offical Fiction area in the Storylines section. 05/26/10 - Today we held our very first event! Check out how things went for the Kingman Prison Event brought to you by Broken Future with special guests; The Legends of the Fall and Slim Jammies from Pixel Junkies. We had a blast and hope to do many more events in the near future, so keep a look out. 05/17/10 - Site Update: Added Embry Crossroads Monster Hunt Guide and related items, Vehicle Database update to include lower level mounts, inner-site linking for starter town & tutorial mission rewards, a easier navigation menu on the top of each section in the Item Database, updated Oilville Points of Interest page to include the Hotel Nevada area with some new waypoints, created Official Fiction and Fan Fiction pages in the Storylines section with much more to be added in the future, some further links to previous pages, and a slew of tweaks and corrections throughout the site. 05/05/10 - Site Update: Added Merchants & Location pages for Oilville & Embry Crossroads, Points of Interest lists for Odenville/Oilville/& Embry Crossroads, the Oilville Town Event Guide, Clan Database, added the Construction Tradeskill to the Tradeskills section, 23 new items of various categories to the Item Database, and some minor tweaks & adjustments. 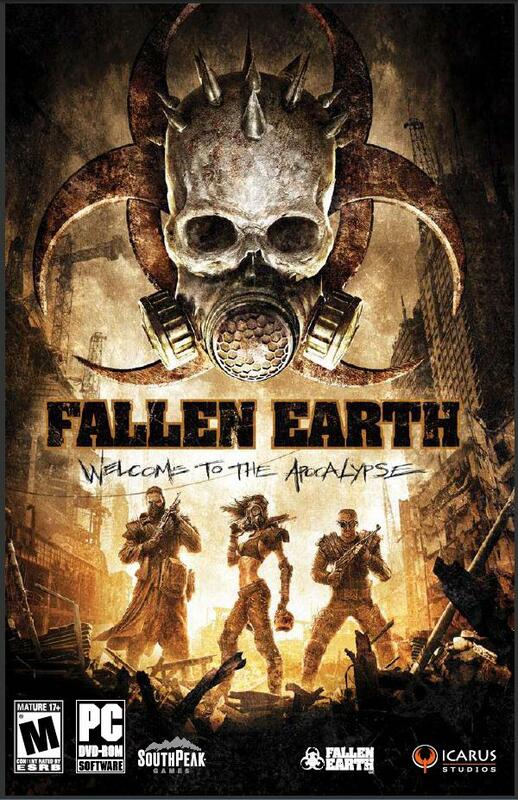 05/05/10 - We're very proud to announce that Broken Future has been included onto the Fallen Earth Fan Sites page and want to thank Pixistix & the rest of the community management team for giving us a chance to help out the players of this awesome game. 05/05/10 - We held the 2nd Wastelander Knowledge Check during the Cinco de Mayo party at Embry Crossroads and had a blast. Feel free to check out the Contest Winners. 04/28/10 - Site Update: Added NPCs, Missions, Merchants, & Locations pages for both Simsonville and Highway Bridge. Added Merchants & Location pages for Odenville. Added NPCs & Missions pages for Embry Crossroads. Large update to the Storyline Missions covering everything in the Lower Plateau. Also, mission items for all newly added missions have been included into the Item Database. On top of all that, we updated the garage & bunker bar location lists, included a Glossary of Terms to the Tips section, added over 100 new items to the Items Database, and a ton of minor tweaks & adjustments. 04/24/10 - The Broken Future Collective would like to give a huge thanks to the awesome folks over at massively.com for including us in one of their excellent articles titled "Wasteland Diaries: Try not to be such a noob" by Edward Marshall. This is a great place for fresh clones to get some insight on how to live long enough to really start enjoying the game. Check it out and thanks again to the team at massively.com for your hard work, we're big fans here at the BFC. 04/22/10 - Site Update: Added NPCs & Missions log for both Odenville and Oilville as well as the respective Mission Items. Stats section has received a much needed update with 38 Special Abilities added. There is now a Bunker Bars Guide in the Guides section. Also, bunker bar & garage location lists are now available. Inner-site linking has been applied to merchants and mission logs are next on the agenda in that area. Finally, there are some new tips, a recommended town level guide, easier navigation links to previous pages near completion, and tons of minor tweaks to keep info updated from recent patches. 04/07/10 - Broken Future - Clan Database: Check out this FE forum thread about the opportunity to have your clan listed in a soon-to-be created database. This thread is open to the public, so check it out if you are apart of a clan and would like to sieze this opportunity. 04/06/10 - Site Update: Added Recipes/Schematics/Instructions List in the Skill Books section of the Item Database covering nearly 100 knowledges and literally several hundred items. Added over 150 items into the Item Database covering almost every category. Also made some progress on the inner-site linking with much more to come. Lastly, vehicle-related-items are now listed in the Vehicles section of the Item Database with Mounts info to come over the next few weeks. 03/19/10 - Site Update: Added Points of Interest pages for each town, 40 new Enemies entered, 5 droplists for Mumford Enemies updated, 23 Biologic Harvest Logs entered in the Harvesting & Scavenging Guide, & last but not least, 45 Misc. Items entered into the Items Database. Much more to come, watch this space. 03/13/10 - The very first Wastelander Knowledge Check Contest is held! 03/01/10 - The site is released to the public although still in its infancy stage of development. All 9 starter towns are logged. The latest in-game patch has put a delay to the release of the points of interest section for each town, but most of the important information associated with each location is available. The Item Database is also nearly up to date with almost every merchant buyable item and mission reward listed. Much more to come, so stay tuned! 02/14/10 - The process of completing the main sections of the site is nearly finished. Keep your eyes peeled for further updating. 11/29/09 - The rough draft of the database is passed along to a select group of clones to begin the evaluation process. 10/24/09 - The Broken Future Collective is created and the concept for the database is started.